The top 1 percent of Americans control 40 percent of the nation's wealth. And, as Joseph E. Stiglitz explains, while those at the top enjoy the best health care, education, and benefits of wealth, they fail to realize that "their fate is bound up with how the other 99 percent live. 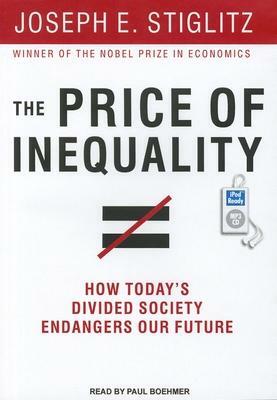 "Stiglitz draws on his deep understanding of economics to show that growing inequality is not inevitable: moneyed interests compound their wealth by stifling true, dynamic capitalism. They have made America the most unequal advanced industrial country while crippling growth, trampling on the rule of law, and undermining democracy. The result: a divided society that cannot tackle its most pressing problems. With characteristic insight, Stiglitz examines our current state, then teases out its implications for democracy, for monetary and budgetary policy, and for globalization. He closes with a plan for a more just and prosperous future. Paul Boehmer graduated with a master's degree and was cast as Hamlet by the very stage actor who inspired his career path. He has worked on Broadway and extensively in regional theater, and has been cast in various roles in many episodes of "Star Trek." Paul's love of literature and learning led him by nature to his work as a narrator for audiobooks, his latest endeavour.